We woke up to the sounds of a busy street in the San Fernando Valley-buses, horns, peeling tires and the occasional siren. Our first stop for the day was Simi Valley and Eternity Bible College which we heard of through Francis Chan, a speaker at Challenge youth conferences. It is definitely a low budget operation. Occupying a corner of a strip mall with a hundred students who all commute, it was certainly a contrast to Pepperdine. Our next stop was Master's College in Santa Clarita. We had a conversation with an admissions officer and Esther was our tour guide. She found her freshman dorm room. Then we went to Azusa Pacific University and caught a tour. It is a fairly large school with many opportunities. 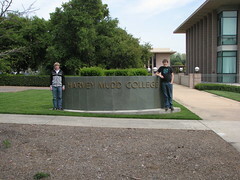 The last school for the day was Harvey Mudd College, a prestigious liberal arts college that specializes in the sciences. All students major in science and the academics are very rigorous. We were able to join an extensive tour of the campus, much of which is underground. One peculiar feature of this campus was the abundance of skateboards. Two thirds of the students we saw were on some form of wheels- longboards, scooters, bikes and even unicycles. It was easily the most unique school that we have visited. We've camped tonight at a motel in La Mirada, poised to visit Biola in the morning.